The heroes of the Marvel Universe storm the beaches of Red Skull’s Genoshian Reeducation camps. What they discover within will lead to a bleak new era. The revelation of Tony Stark’s dark secret promises to shatter the fragile alliance between A and X. The all-new Captain America pays a terrible price. Nova’s attempt at solving the crisis leads to disaster. Magneto betrays his alliance to join an army of evil. 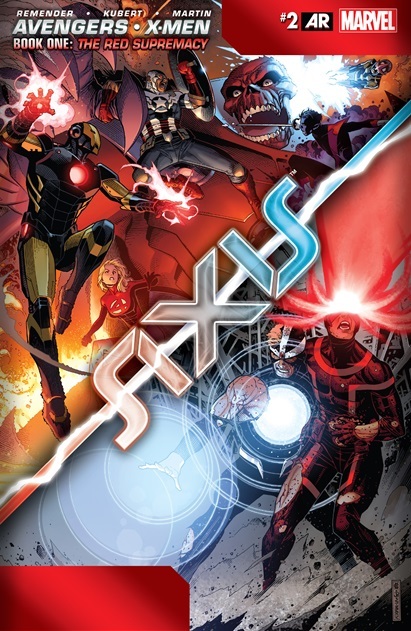 Story-The Adamantium Stark Sentinels from last issue cut a swath through the combined forces of the Avengers, X-men and Uncanny Avengers. All new Captain America sacrifices himself to save a distraught Iron Man. Magneto, Scarlet Witch, Rogue Iron Man and Dr. Strange try to launch a counterattack. The two mages try to create a spell to bring the shred of Prof. X to the fore. They are interrupted and Stark is almost killed. Magneto upset by Stark’s hand in the creation of the sentinels leaves him to die. The survivors save Stark and mount a last attack but are all taken down except Stark. Alone, weak and defeated Stark is saved by Magneto and his gathered band of villains. Art- Adam Kubert is still on art and it all looks mighty fine! Cover– This time we have the cover divided diagonally with Iron Man, the all New Captain America, Kid Nova and Nightcrawler battling Red Onslaught while on the lower end we have the summers brothers rallied together, powered up and ready to go. It’s pretty cool looking and sticks to the formula established in the opening arc pretty well. Villains– As cool as it was to watch the heroes fall it was ten times better to watch Magneto show up with Sabretooth, Mystique, Carnage, Enchantress, Deadpool, Hobgoblin, Loki, Jack o lantern, and Dr. Doom. Epic moment! Emotion- This issue packed a powerful emotional punch thanks to Iron Man’s guilty conscience. As the tale continued Tony was knocked down multiple times as his teammates and later his allies all get taken down. Red Onslaught’s taunts also added even more rungs for Tony to tumble down. If this is the lead in to superior Iron Man, I like it! New Captain America– Of all the black heroes so far that have received a cameo, Samuel Wilson has certainly shone the brightest. Last issue it was him taking charge of the situation in a far different manner than his usual “in the background” self. This issue he sacrifices himself to save Tony Stark, the very man who is responsible for creating the sentinels which are taking down our heroes. I also must say that his costume especially while in flight looks pretty awesome. Black Heroes- So all New Captain America gets taken down in the opening pages and I can’t think of one other black hero that shows up. Isn’t he on a team with Blue Marvel? Where the hell is Blue Marvel? Where is Photon? Oh marvel what is the use of having these powerful black characters if every time there is a world ending threat they are all just elsewhere and/or busy? Please remember the ‘3-Black Hero Rule’… because I found myself asking the EXACT same questions as you while viewing the issue. Didn’t someone… ANYONE think that Photon or possibly The Blue Marvel would be a big help in this situation? I am expecting a Luke Cage showing and maybe… slimly, a Storm appearance, but I think they will be controlled and spaced out in the issues. Heck, I doubt that they would even let them talk to one another in a single panel. What I am truly hoping for is the breaking of the ‘3-Black Hero Rule’ by a White writer in a main stream event such as this! The 3-Black Hero Rule: If three or more Black superheroes are placed on the same team in the same comic, the comic book is then referred to as a ‘Black’ comic, dropping it instantly to second tier (or lower). Sales of the issue will be impacted, comments will be made, and the adventure will drop from cosmic, global, or even international… to local in feel, tone, and storytelling. If there is EVER a time to break this rule – it is NOW!! With ‘Falconamerica’ leading the pack, Storm loving every White guy under the sun, and Cage finally accepted into the ranks of the White-side (thanks to his White wife and Steve Rogers vouching for him for NOT being a thug)… these three SHOULD be able to be placed together on the same team and NOT drag the book into the dreaded ‘BLACK – Marvel – ZONE’. They are all main stream (I think) and our White friends have accepted them. Heck, I’ll even take it if they bend the rules, to be safe, and let Storm associate herself with the X-Men, while the other two present themselves as Avenger. It’s a work-around, but if that’s all we have…. then it’s worth taking it! We will see, so let’s keep our fingers crossed and have hope!! I’m an old man and I think real integration is not realistic and Blacks must come to grips with the fact we’re a small part of the USA despite over representation in other areas of entertainment.